Experiencing the multiple award winning software has never been that easy. We thought about making your decision to switch to Multicharts even easier: For every lifetime license of Multicharts that you buy by simply following the link on this website you’ll receive one hour worth of programming service or personalized one on one coaching to jump start your Multicharts experience with us. For every Multicharts and Multicharts.NET bundle that you buy, you even receive two hours of free programming service or free telephone coaching. 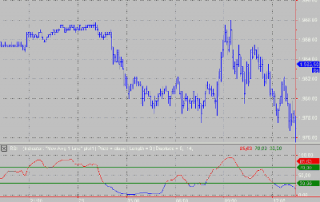 The time could for example be used to convert studies you are currently using to Multicharts PowerLanguage or for work on your custom project – like an indicator or trading idea you want to backtest. The coaching can help you in quickly advancing on the learning curve and getting the most out of the software. There are no hidden additional fees and you’ll buy directly from Multicharts. To be applicable for the bonus all you have to do is starting the buying process via the links on this website. Click here to get to the payment links directly. Having been asked this question over and over again – “what is the best trading platform?” – my answer always is the same. There is no such thing as the best platform in my opinion. This is the same as asking for the best novel, the best car or the best sport. Ask ten different people about the best novel in the world, chances are you’ll receive ten different answers. And guess what, they are all correct as it is a very subjective thing and comes down to personal preferences and likings. So the best trading platform for you is the platform that offers you the features and usability you need at a price you can effort. Having said this I can tell you why Multicharts is my number one platform amongst all platforms I use. 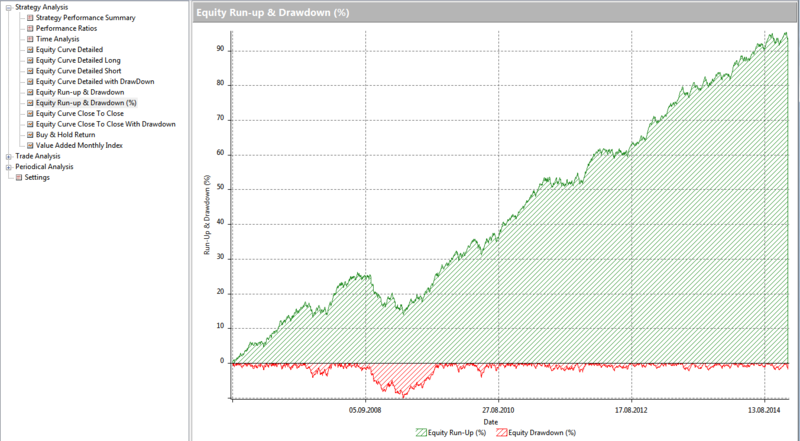 Multicharts is a feature rich platform and offers a lot of tools that are very useful for both the algorithmic and the discretionary trader. Let’s take a look at some of the features and advantages Multicharts offers. Due to the vast amount of features I can only show you a limited amount, but this should still give you a good idea if the platform is for you. All features I display can be found in both Multicharts and Multicharts.NET. You can find more detailed informations and feature descriptions directly at www.Multicharts.com. 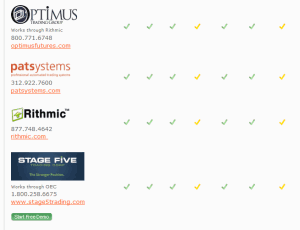 Multicharts offers access to all popular data providers giving you the freedom of choice. You can even use multiple data feeds for backup reasons or to access more markets. 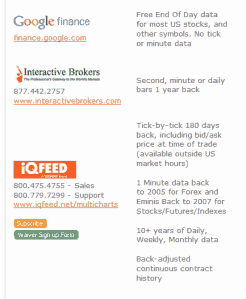 A huge list of brokers are supported as well and even more are added with every new release. 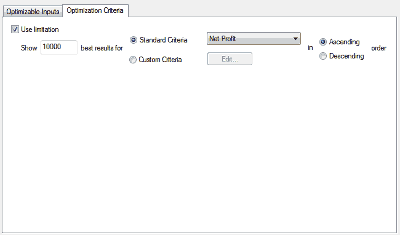 Just recently the popular Forex broker Oanda has been added for example. 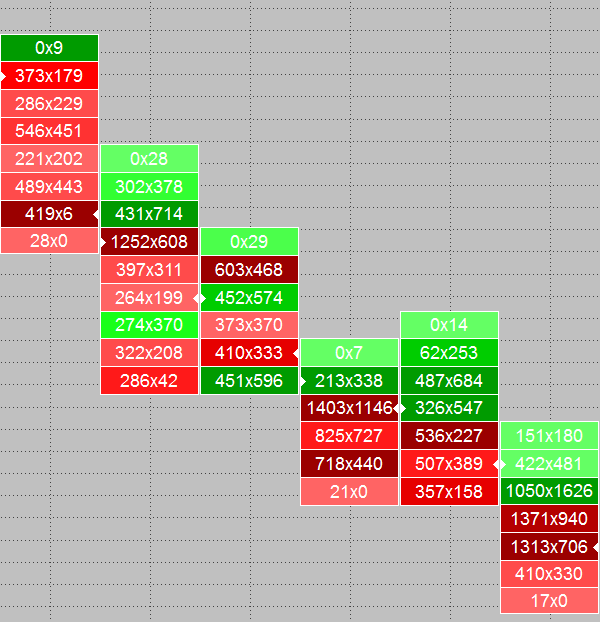 Connect Multicharts with one or more broker accounts and trade directly from the chart or Depth of Market window (DOM). 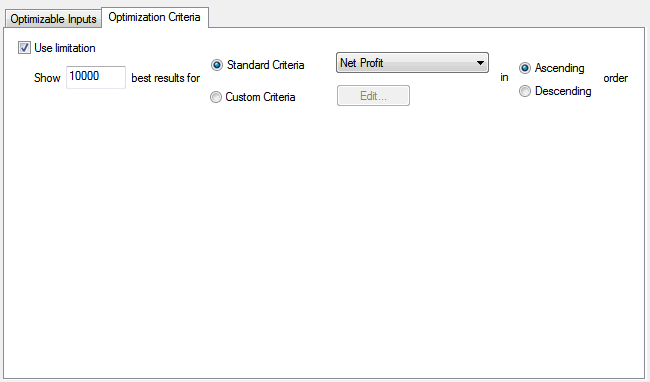 Multicharts can automatically attach customizable profit target and stop strategies to your manual entries. 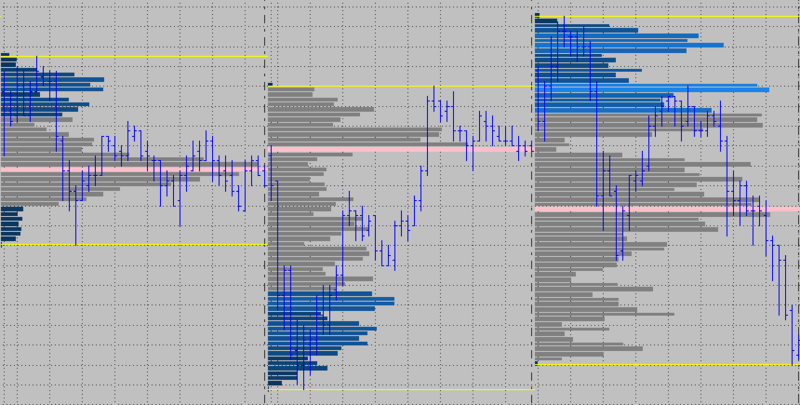 This ranges from simple stops to complex strategies with multiple targets, break-even levels and so on. All are easy to set up and customize to your needs. 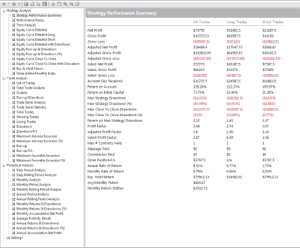 If you prefer hands free trading, the powerful strategy automation engine makes it easy to write algorithmic trading strategies. 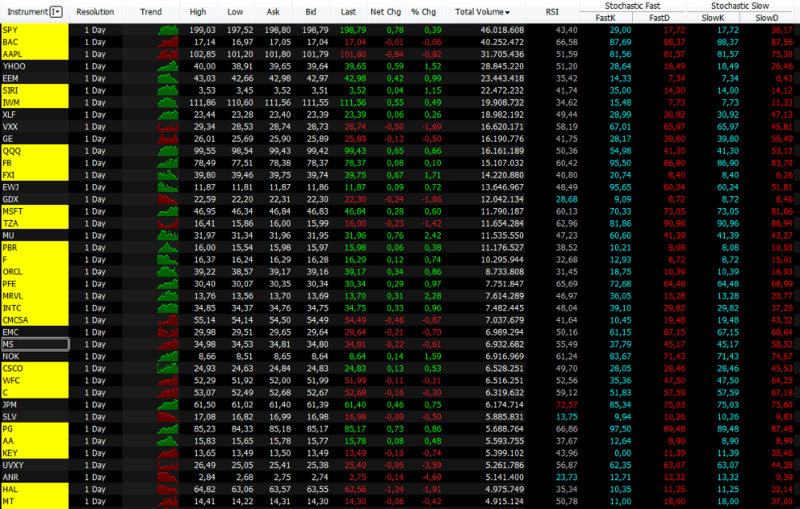 These can automatically be executed on single charts or a full portfolio. 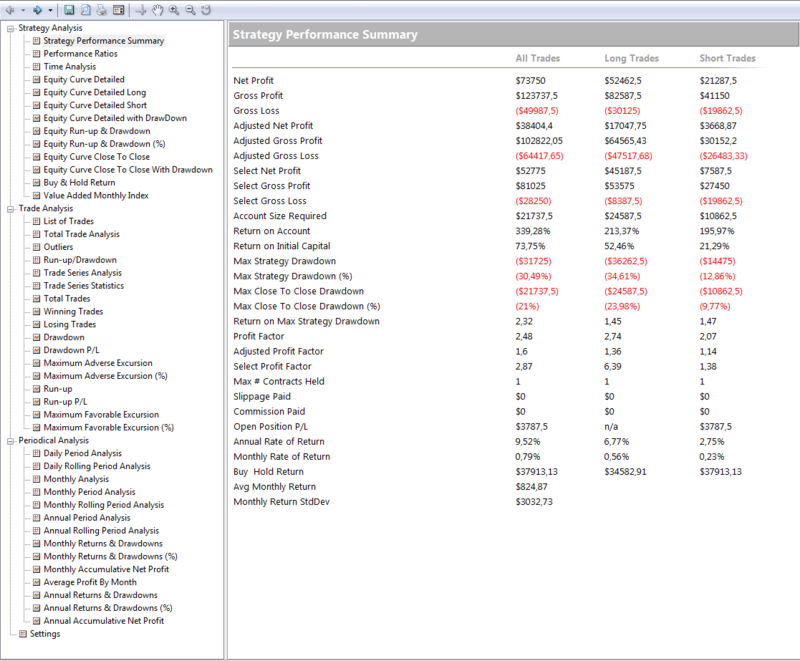 Multicharts creates detailed performance reports automatically so you can easily evaluate and compare various performance metrics from both automated strategies and manual trading results. 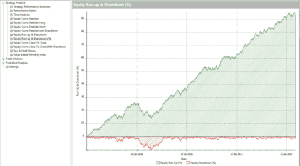 Multicharts offers true dynamic Portfolio Backtesting and automated live Portfolio Trading. If you talk to investment greats or read from Market Wizards many will tell you that Portfolio trading is as close as you can get to the holy grail. 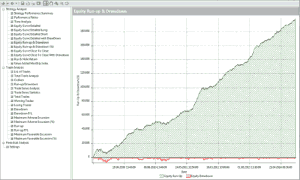 Multicharts offers you the tools you need for designing and running profitable portfolios. Of course designing profitable strategies is no piece of cake, but a long and winding road with pitfalls around every corner. 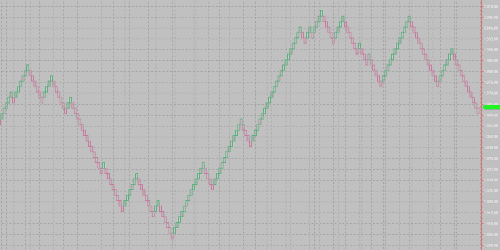 One of the many dangers in designing reliable trading systems lies in fitting the strategy or its input parameters to the data you use to develop the signal. Having worked with many traders that ran into this pitfall and having done the mistake many times myself when starting out developing strategies, I know from experience that it’s very easy to create the fallacy of an immensely profitable system. This is likely to happen to the new, aspiring strategy developer and only experience and a rigorous method for testing your strategies will help you spotting issues before your money is on the line. You probably have come across a number of great looking commercially available signals from some sleazy vendors. 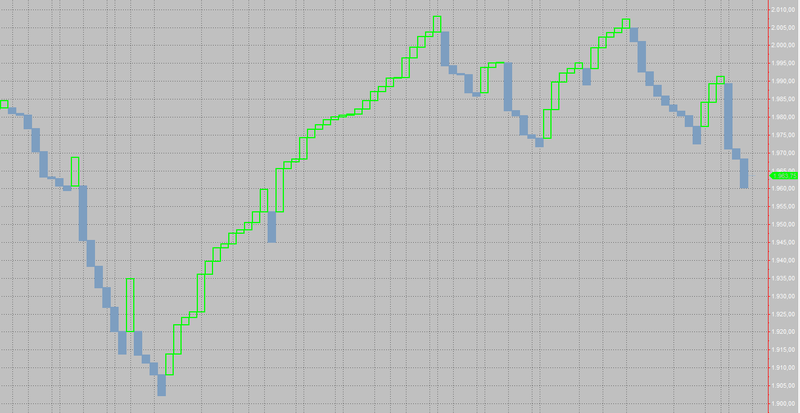 Many of them heavily rely on the power of curve fitting in producing what looks like your own personal ATM. Only after you have bought the strategy it turns out that the realtime results don’t even come remotely close to matching the advertised historical performance. 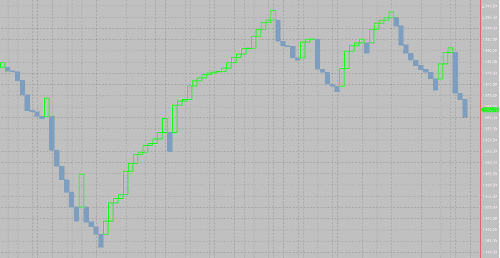 You don’t want great looking equity curves for historical periods and a complete collapse on new, unseen data. 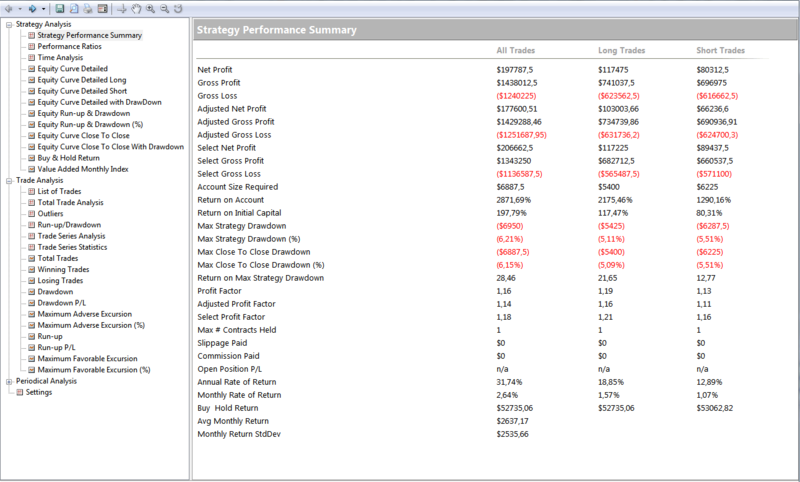 The strategies you want to look for should display a similar behavior historically and in the future. Multicharts offers you tools you need for successfully developing and testing strategies. It comes with the ability to optimize strategy inputs by brute force (i.e. testing all possible combinations) or by using the genetic optimizer that will help finding better combinations a lot faster. 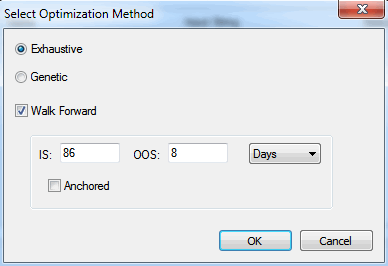 After that the Walkforward Optimizer is a very useful tool to check for robustness of the results. 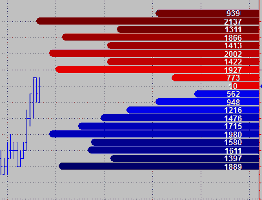 Volume profiles display the summation of the traded volume at each price. Either for a single period (a session for example) or as a combined profile for several sessions. This is very helpful in gauging support and resistance and it’s directly based on market generated information. 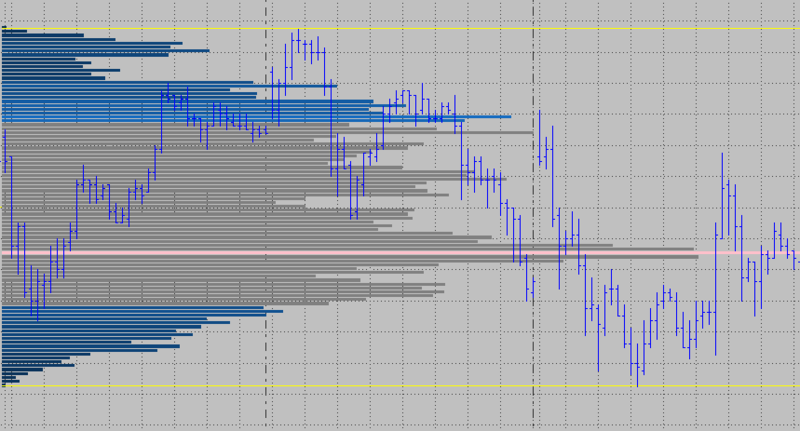 Volume Delta Bars provide an insight look into the trading that occurred at the bid and ask at every price. 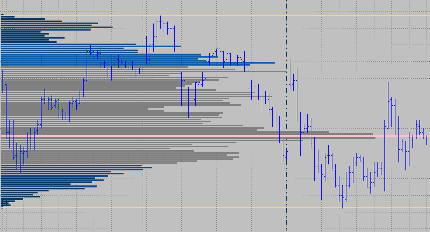 You see the bid and ask volume at each price, as each trade took place within the bar. 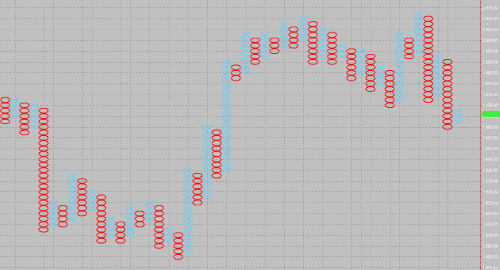 This is also something widely used for seeing a market finding support or resistance. Buy a lifetime license for Multicharts today and you receive all future upgrades free of charge. You are always able to use the latest platform and newest features. Even features that are not yet implemented or available by the time you buy the platform will become available for you for free. You’ll never have to worry about dealing with an outdated platform and how to make it work with modern technology again. You buy it once and don’t have to pay monthly leasing fees that quickly add up to much more than the one time fee for Multicharts. Besides that all features are included in the program and with every license. You don’t have to buy or lease additional functionality like the Portfolio Trader or the Market Scanner – you can unleash the full potential of the platform to help you with your trading success. Multicharts was one of the first platforms to offer a true 64-bit version that is able to take advantage of all the benefits that come with a 64-bit environment. For example higher memory support and better overall performance make it handle time consuming tasks in only a fraction of time. 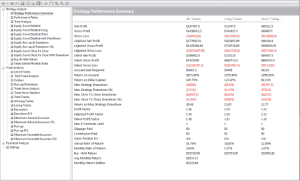 Multicharts also still offers full 32-bit support, so you can choose the right version for your operating system and computer. Multicharts enables you to compute and display indicators on another indicator without any programming. 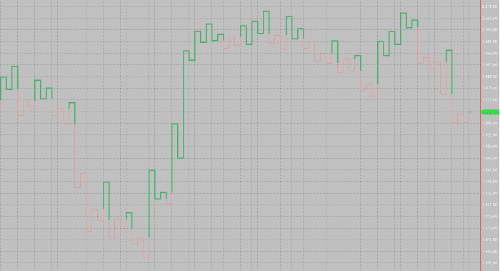 If you want to compute a RSI on a simple Moving Average you can display the results on the chart with just a few clicks. 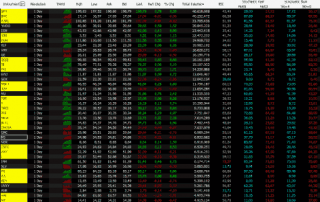 The Scanner in my opinion is undervalued by many, but it can really boost your trading performance. You can have all necessary information you rely on at a glance on just one screen. 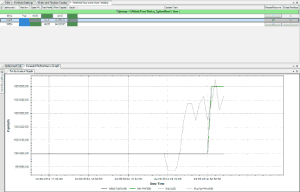 Think of it like a powerful quote board that allows scanning a symbol universe and displaying indicator results and market information at a glance. 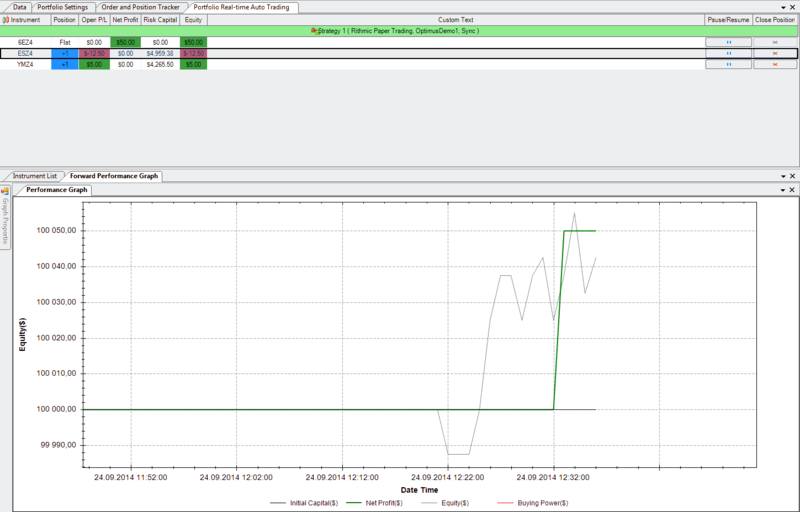 It’s even possible to automatically sort the outcome in realtime with every change. 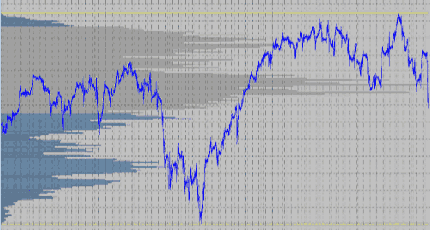 Multicharts is able to display a huge variety of different chart types. 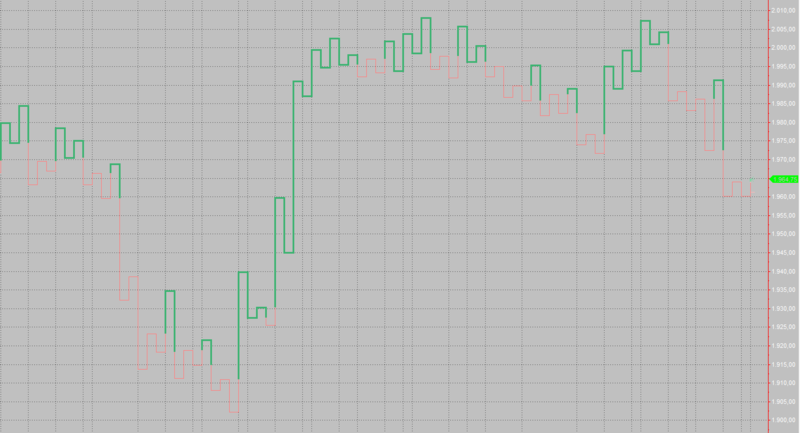 For example regular charts with different resolutions (time based or contract/tick based), but it doesn’t stop there. You can add Kagi, Renko, Heikin-Ashi or Point and Figure charts (plus many more) to your arsenal and run indicators or even signals on them. You can also combine different chart types, bar intervals or symbols into one chart and see what’s going on at a glance. This might not seem like a feature, but having worked with numerous software platforms let me tell you this is a real important one. The Multicharts developers listen to their customers and implement useful features that are requested. 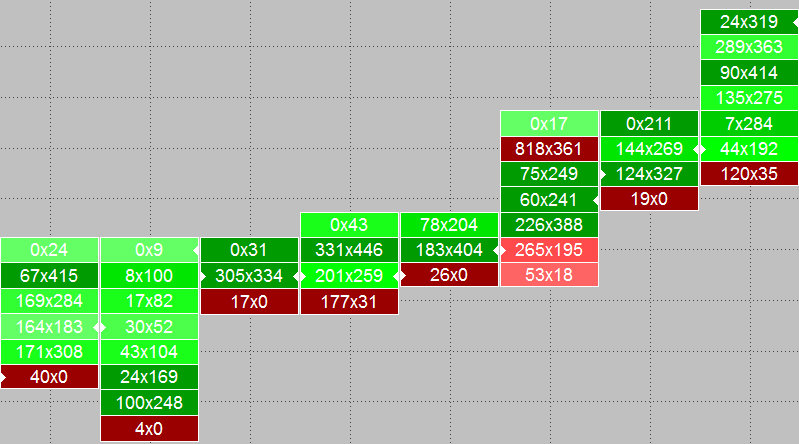 Over the years a lot of things that customers have requested have found it’s way into the program – Portfolio Trading, Volume Profiles and Delta Bars just to name some. Obviously not every requested feature can and will make it, but if it’s useful for many users the chances are quite good. There is competing software around where even useful feature requests go unimplemented for years, this is something that you won’t experience with Multicharts. Multicharts has a great team offering top notch support and help via chat, telephone and the forum. In case you run into an issue with your platform, things can usually be quickly resolved as a skilled support technician is only one call away to help you. This gives you the peace of mind that problems won’t keep you from trading and possible downtime is reduced to a minimum. 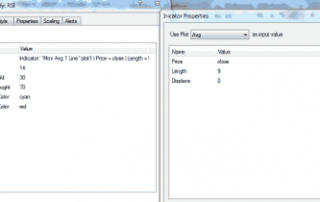 PowerLanguage is an EasyLanguage friendly programming language. It has a flat learning curve, but still allows you to create very complex tasks easily. If you are a professional programmer MC.NET might appeal more to you, as with C# or VB.NET you are very flexible and can use the .NET Framework. Although the programming language in MC.NET is more powerful compared to the regular Multicharts with PowerLanguage, I am willing to wager that you can do almost anything in there that you can do in MC.NET, too. Also developing code and making changes to it will usually be quicker. 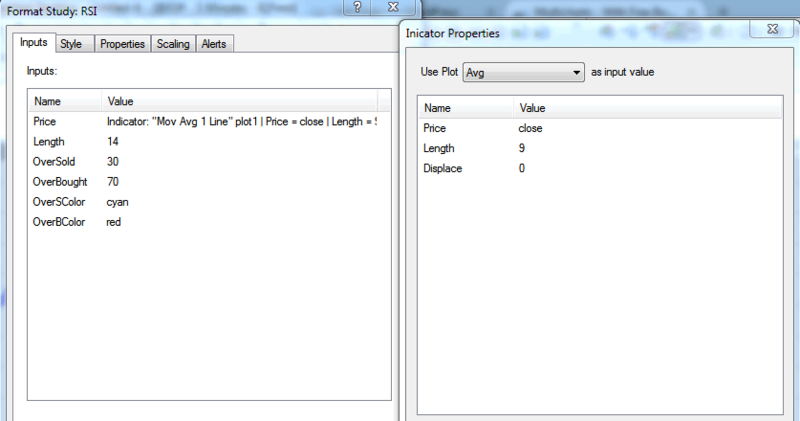 Plus you can use most of the existing Tradestation EasyLanguage code right away without any changes. Therefore and unless you really want/need to use the MC.NET version, I would always suggest to go with Multicharts that offers the PowerLanguage capabilities first. Should you ever decide that you need to use MC.NET you can either get an additional license at a discount or convert your existing MC license for a small fee. Multicharts has a tracking system that can track if you bought your license via our link. To claim your bonus simply contact us within 90 days after your purchase with the name that was used in the process. Once we have confirmation from Multicharts we will contact you, so you can start using the time for our services. It’s not possible to receive the bonus as cash disbursement and you can only receive the bonus if you bought through the links on this website. We reserve the right to cancel, change or discontinue this program at any time. Purchases made already at that point won’t be affected. If you prefer a subscription based model, Multicharts offers quaterly, semiannual and yearly subscriptions. Using one of the links below you can subscribe to the model that suits you best. Please understand that our bonus and the one year free FX Data only applies when you buy a lifetime license or bundle. We are providing solutions for independent traders, trading groups and hedge funds since 2005. We are experts in custom PowerLanguage programming for Multicharts. Besides projects in EasyLanguage for Tradestation, we have provided clients with strategies and indicators for eSignal, Ninjatrader, Metatrader and other major trading platforms. Risk Warning: Trading Futures, Options on Futures, and retail off-exchange foreign currency transactions carries substantial levels of risk and is not suitable for all investors. Before deciding to invest in financial instruments or foreign exchange you should carefully consider whether trading is suitable for you in light of your circumstances, knowledge, and financial resources. The high degree of leverage can work against you as well as for you and you may lose all or more of your initial investment. TradeStation®, PowerEditor®, EasyLanguage® and the EasyLanguage Specialist logo are trademarks of TradeStation Technologies, Inc. Neither TradeStation Technologies nor any of its affiliates has reviewed, certified, endorsed, approved, disapproved or recommended, and neither does or will review, certify, endorse, approve, disapprove or recommend, any product or service that offers training, education or consulting regarding the use of EasyLanguage®. Copyright 2019 ABC Trading Group | All trademarks and copyrights are the property of their respective owners.